IRNA – Iran and Pakistan expressed their resolve not to allow any other party or group to hurt the relationship between the two countries. The consensus reached during a meeting between Iranian Foreign Minister Mohammad Javad Zarif and National Security Adviser of Pakistan Nasser Khan Janjua here. Both sides agreed to practically improve the focus on resolving the issues through border mechanism and enhance engagements between the civil and military leadership. 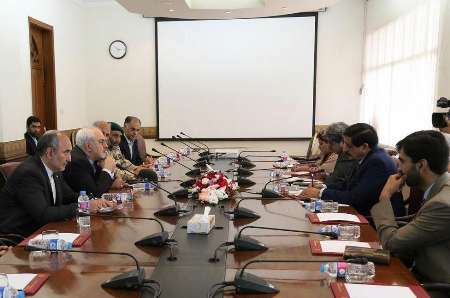 Zarif, leading a high-level security delegation, paid a day-long visit to Pakistan on Wednesday to seek better cooperation of Pakistan to bring the terrorists to justice involved in recent border incident which resulted in the martyrdom of nine Iranian border guards. Zarif in the meeting with Pakistan national security adviser stressed the need to establish effective joint mechanisms at local and national levels. He said more regular meetings should be held at different levels to resolve small mutual problems. Zarif said that the Pakistani authorities should take effective measures to stop terrorist activities in border area. Pakistan National Security Adviser on the occasion offered his deepest condolences on the border incident in which several Iranian guards were martyred. “Pakistan and Iran are strength of each other,” Janjua said. He reiterated that Pakistan sees a great future with Iran. He briefed the foreign minister on the security situation along the border and how the two sides need to make efforts to harden their stances against those who are involved in terrorism, smuggling, human and drug trafficking. The adviser reassured the Iranian side of persistent efforts of Pakistan to work against those who are hurting the common interests of both the countries. Pakistan could neither approve nor support any group who can work against Iran, he underscored. Foreign Minister Javad Zarif during the second day visit to Islamabad, also met with Prime Minister Nawaz Sharif, Interior minister Chaudhry Nisar Ali Khan, Speaker National Assembly Sardar Ayaz Sadiq and Pakistan Army Chief, General Qamar Javed Bajwa.